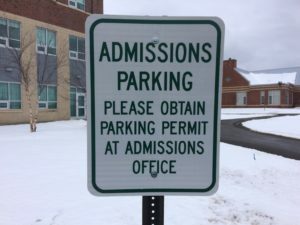 BANGOR, Maine – Husson University currently requires that all students who bring cars on campus purchase parking decals. These decals are small, round, yellow stickers that cling to the inside of car windshields. Students must pay a $100 fee at the beginning of each school year to purchase a parking decal. The decals are valid for the fall and spring semesters of the purchase year. A current Husson parking decal. Students will not need decals in the 2019-20 school year. A walk around the student parking lots on College Circle and Kagan Drive on Husson’s campus reveals that many of the parked vehicles lack yellow decals. In fact, there are more cars without decals than those that have them. It seems students are not following the rule mandating that all cars on campus purchase and display parking stickers. This reality means Husson Security officers write ample tickets for drivers without decals, right? Wrong. Students are rarely ticketed for not having parking decals on their vehicles. Why would anyone pay the $100 fee to buy a decal if there is no consequence for not having one? The Spectator investigates. Husson’s Director of Safety and Security Ray Bessette is in charge of parking organization and enforcement on campus. Under his direction, Husson uses a community-based approach designed to keep the university safe. 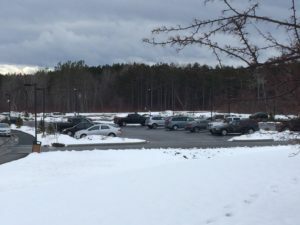 Security officers at Husson write multiple warnings to students who have no decal, park across hash marks on the pavement, or park on the grass creating a space of their own when lots are full. It is only when someone becomes a repeat offender that he or she receives a citation with a fine. Bessette said drivers who do not pay parking tickets will have their vehicles towed off campus, but this is a last resort. Despite the friendly nature of Husson’s parking enforcement, there are a few violations that result in immediate tickets. Students who park in handicapped spots or block building fire lanes will receive citations. 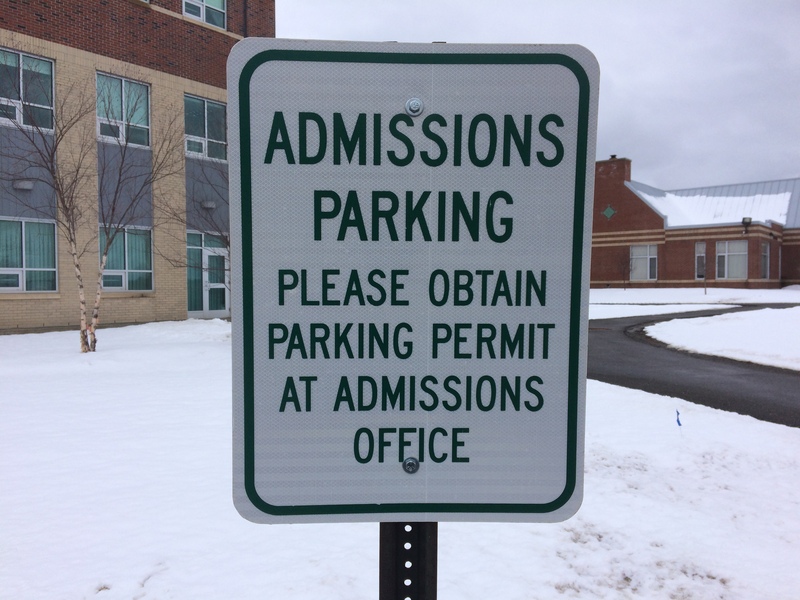 The only other parking infraction that frequently leads to tickets is when students take designated visitor spaces near the Husson admissions office. The reserved admissions parking spaces are located in front of O’Donnell Commons. Violations such as parking in handicapped spaces, fire lanes, or admissions spaces will continue to be enforced by Husson Security officers. The university’s parking decal program, however, will soon undergo major changes. One of the reasons Husson students do not purchase parking decals is the financial burden of the $100 fee. This may not seem like a lot of money, but it is another expense related to the significant cost of attending college. Husson students who charge the parking sticker fee to their student ledger may pay for a decal with financial aid, as opposed to cash out of pocket. 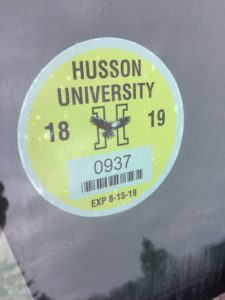 Prior to the adoption of exclusively yellow parking decals on campus this year, Husson had numerous color-coded decals for different types of drivers. Resident students, commuters, staff, and faculty all had distinct decals that corresponded to select lots where they were permitted to park. 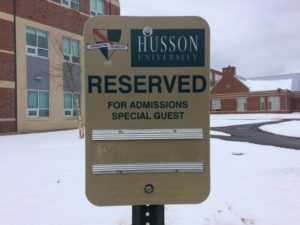 Husson built a new parking lot next to the New England School of Communications in the fall of 2018. There are never more cars than parking spaces on campus. This led Bessette to scrap the confusing, multi-colored decal system last year, and implement a “generic parking pass” in the form of the current yellow decals. Lots on campus were also redesignated using a simpler system. 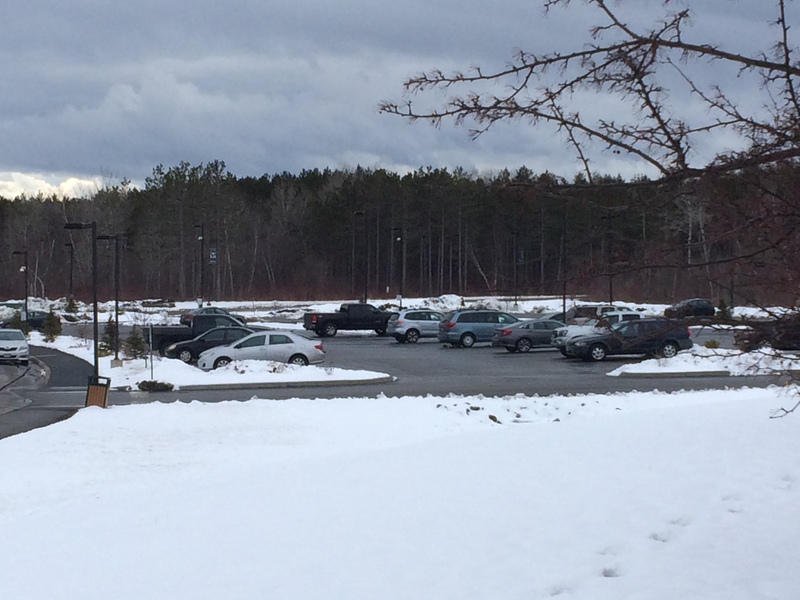 Husson now has resident lots, overnight lots, and daytime-only parking lots. Despite these changes, parking decal compliance is still low and some students still struggle to pay the $100 parking fee. This Husson lot was designated as daytime-only parking in the fall of 2018. “Less than half of the cars on campus currently have [parking] decals,” Coleman said. 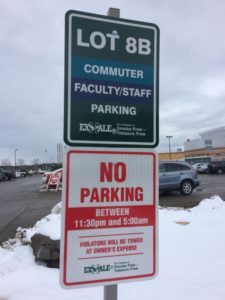 The burden of the fee and the compliance issue prompted Husson Security to streamline parking organization on campus. Husson’s parking system will be revitalized for the 2019-20 school year. Campus security will have a new link through the Husson student portal where drivers register their vehicles according to license plate number. There will be no charge for registering cars through the new system. Commuter students may register multiple vehicles on the portal. This will allow commuters to bring different vehicles to campus if they have more than one car in the family. Under the new system, Husson Security will be able to contact students if their cars need to be moved due to parking violations. Bessette hopes this new registration process will reduce the already-low amount of parking citations written by campus security staff. An email with instructions on how to register a car on the student portal will be sent to all Husson students during the summer of 2019. The only things students need to complete the process are their license plate number and their Husson Eagle ID number. Safety will also increase under the license plate-based registration method. Husson Security officers will have a database with the plate numbers of every vehicle that belongs on campus. If a suspicious car is found on university property, officers will easily be able to punch in the vehicle’s plate number and find out if it belongs on the premises. Perhaps the best part of the new parking system is the elimination of the $100 decal fee. Bessette said there will no longer be any parking-related charges assessed to students [provided that they do not receive monetary parking citations]. 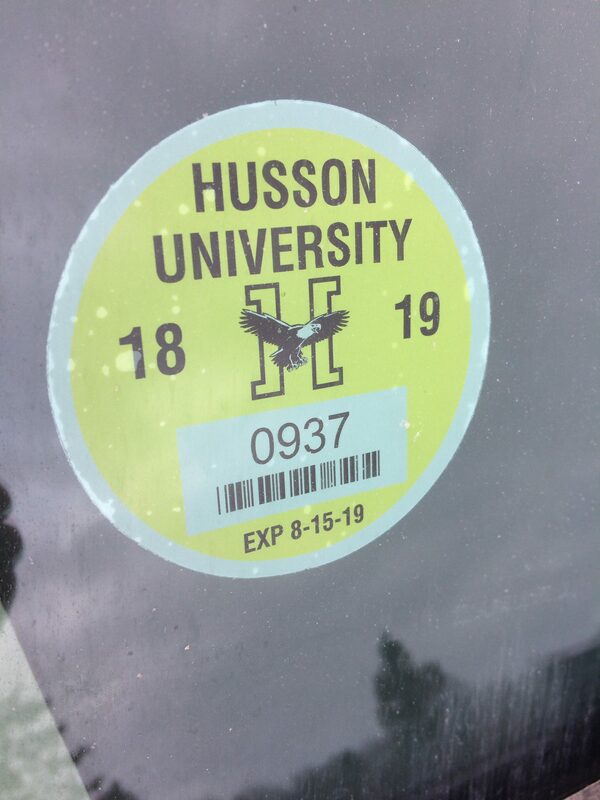 Although students must register their plate number on the Husson portal for the 2019-20 school year, there will be no line item charge for parking on the student ledger. According to Husson’s Director of Safety and Security Ray Bessette, there are never more cars than parking spaces on campus. Husson student Kyle Tremblay keeps a car on campus. He is one of the compliant students who has a parking decal on his windshield this year. Tremblay is an employee at the NESCom Equipment Distribution Center, which is open until 1 a.m. on weeknights. Given the cost of maintaining Husson’s parking lots, Tremblay said he understands the need for the current $100 parking fee. He is looking forward to the new system that will be more equitable. Right now, students with decals are paying to park while those without decals are getting a ‘free ride’. This situation makes students like Tremblay, who purchased parking decals, feel like they wasted their money.